So as I was prompted to make my first Christmas Card I thought I'd also make my first Christmas 3D project too. I've opened up a play list on my You Tube channel to pop these videos in each week or so. I thought I'd do a demonstration using the Stampin' Up! box making punch board as I don't think I've done one before and it was only when I'd almost finished this cute little Christmas stack that I realised that Stampin' Up! have retired the punch board. Oh well, on with the show, I'm never shy of using retired products after all a lot of people have them in their stash, it's not like they vanish on June 1st each year. So I used the fabulous festive DSP from the current main Stampin' Up! catalogue, I think it's called Merry Mistletoe. 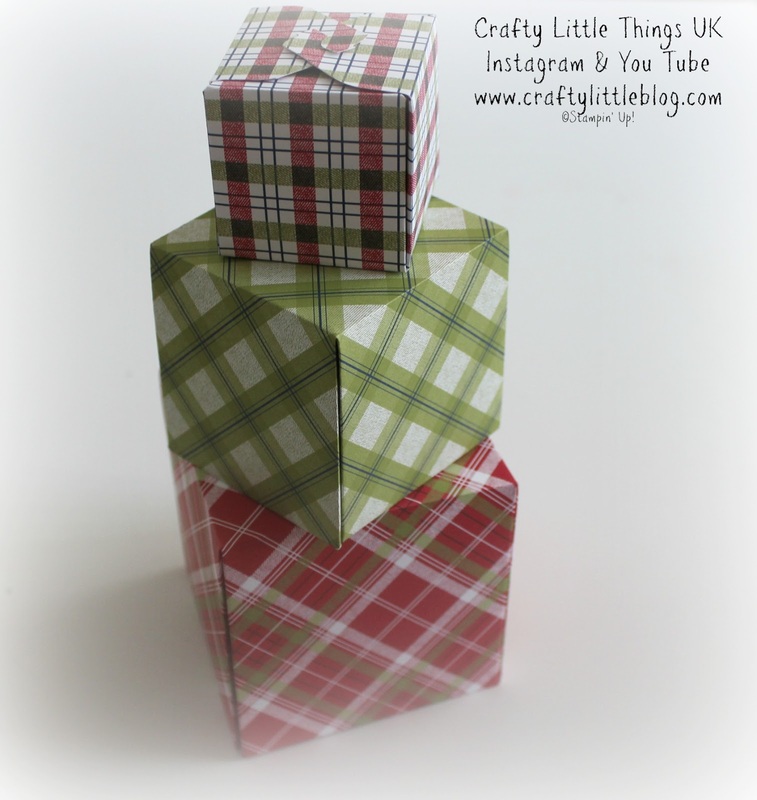 I opted for the plaid patterns to make this little stack of boxes which could be used for gifts, decor or as a photo prop or a nice piece of decor on your festive craft stand this season. There is a video to go with this project on my You Tube channel so drop in and take a look. If you haven't got that punch board never fear it may well pop up on resale sites or on the Stampin' Up! clearance rack at some point and there are other brands out there.